The return of the market is simply the average return of all investors, before any costs have been deducted. In real life, the returns achieved by investors need to take into account the costs of transacting in the market. The simple maths means that the average investor in lower cost funds will beat a majority of investors invested in higher cost active funds. 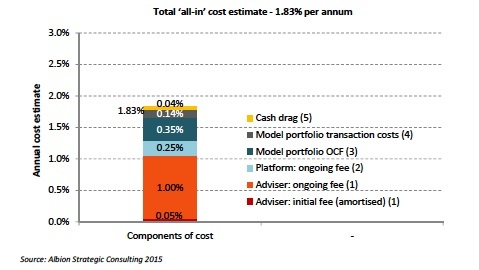 The range of fees and costs incurred by investors is long, complicated and hard to put an accurate figure on. The ongoing charges figure (OCF) is the overt cost that investors incur by investing in a fund. 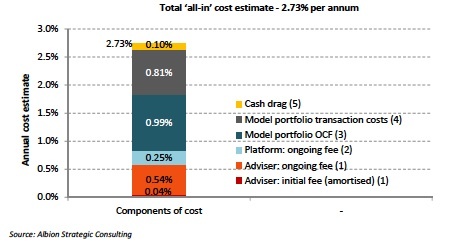 This is the sum of the Annual Management Charge (AMC) charged by the fund manager and the other direct costs incurred by the fund, which can be offset against the fund’s performance. As such, the OCF is nearly always higher than the AMC alone. OCFs can be found in the Key Investor Information Documents (KIIDS) that each fund or ETF is required to produce. These are the covert costs incurred by investors when securities within a fund are bought and sold. The costs are the product of the proportion of the fund that has been turned over and the costs of transacting the trades to sell and buy securities. The figures below provide a summary of the estimated cost differential based on the latest research, capturing both the seen and hidden costs. It is impossible to overstate how important it is to manage costs of all kinds tightly. This is done best through a systematic, low cost approach to investing. In investing, realize that you get what you don’t pay for. Whatever future returns the markets are generous enough to deliver, few investors will succeed in capturing 100% of those returns, simply because of the high costs of investing—all those commissions, management fees, investment expenses, yes, even taxes—so pare them to the bone.